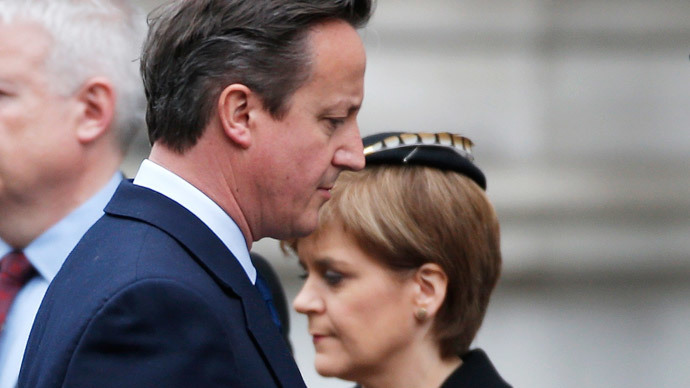 Devolution and Tory plans to scrap the Human Rights Act are expected to be on the agenda when Prime Minister David Cameron and SNP leader Nicola Sturgeon hold official talks on Friday. With both politicians basking in their respective electoral successes, the meeting is billed as a clash of ideological titans, as Sturgeon, whose anti-austerity rhetoric now almost entirely dominates Scottish politics, faces off with the Tory PM. Sturgeon, whose party won 56 of 59 Scottish seats, will be determined to ensure the fullest possible devolution of powers by Westminster to Scotland. “Public spending and the protection of Scotland's budget will be key issues on the agenda when we do meet,” said Sturgeon. Another issue to be discussed could be the Tory pledge to scrap the Human Rights Act, a suggestion which has caused uproar north of the border. The fear of such a move is shared by the SNP’s Labour rivals. Scottish Labour’s Deputy Leader Kezia Dugdale echoed the Nationalist’s view at Holyrood on Wednesday, saying: “These benches will do everything that we can to oppose any attempt that the Tories make to scrap the Human Rights Act. The meeting is due to take place in Scotland on Friday.